One can enjoy all wet and dry area in your own pace. You may opt to swim in the lapping pool first or go straight to rainfall acupuncture massage. 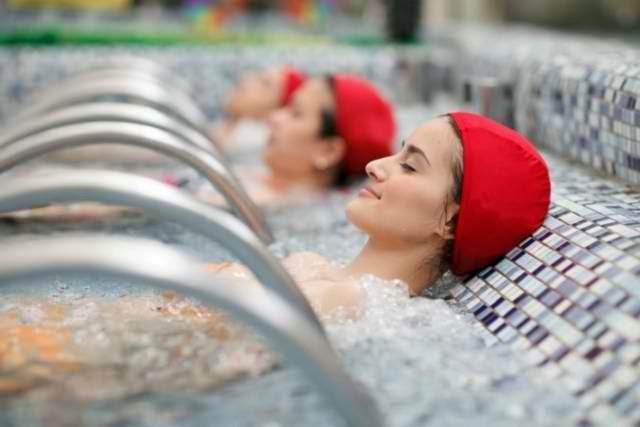 Ace Water Spa recommends spending and utilizing the four (4) hours inside the spa to relax and your mind be revitalized. Prolonged exposure to the aqua massage jets might cause muscle soreness and extreme fatigue. Four (4) hours is long enough as compared to the 45-min to maximum 70-min hand massages that are currently prevailing in most spa establishments. The rainfall acupuncture massage is one of our favorite, other massages tend to feel weird or tickle us so much that we ended up in boisterous laughter. Each jet massages are set for 3 minutes once the button was pressed. You may opt to stay and keep pressing the button if you enjoyed the massage. There are 4 hot herbal pools, each have different aromas (Jasmin, Mint and Chamomile) and temperature (36, 38 and 40 deg Celsius). There's a small ice cold pool in the middle of the herbal pool area. It was advised to dip in the cold pool after staying at the hot herbal pool, this process is called Contrast Therapy Plunge. It is a special hydrotherapy experience wherein an alternate plunging in the hot herbal pool and cold pool is involved. Immersion on hot herbal pool will open up pores to allow the release of body toxins while stimulating blood flow to the core of the body while tightening the pores. Alternate immersion is recommended to keep your body temperature and heart rate at a healthy level. We stayed on all herbal pool except for the 40 deg Celsius pool. It was too hot that we couldn't bear to dip our whole body. I was able to dip my feet only for a minute, and Soshi bravely immersed himself in the pool, then a minute later came jumping out of it. The herbal pool was able to soothe our muscles, almost preparing our body for a slumber. After staying at the herbal pool, we also tried the steam and sauna room. I enjoyed the steam room and did not like the sauna room. Soshi felt otherwise. I've had breathing problems since a kid, my mom always used to make us inhale the steam from cooking rice to ease the wheezing on our chest and to even out our breathing. My experience at the steam room somehow transport me back to those memories. The sauna room was somehow different, the room was hot and bothering me since I felt like the air was flat and it was hard to breathe. Instructions are scattered around the spa area so one will know which body part the Ultrasonic Jet System targets. We took our time to go through every massages. We utilized and spent 3 hours at the spa then decided to go and ease our grumbling stomachs. - Bring your own bath paraphernalia. I prefer to bring my own swimsuit since its more hygienic, otherwise you can rent the swimsuit and towels at the spa. Bath soap and shampoo are also available in the shower area. It is highly required to wear proper swimming attire. This is the same as for the gents, only swimming trunks are allowed, no exceptions. This is practiced to get the maximum health benefits derived from the spa, swimming board shorts or beach shorts are not allowed since they have the tendency to inflate because of the strong water and air pressure generated during hydrotherapy. - It is not recommend eat heavy at least 30-mins before the treatment to avoid the risk of vomiting due to strong pressure. Soshi and I enjoyed all the hydrotherapy massages in the pool area. We also enjoyed the herbal pool, though we were not thrilled with the sauna and steam room. Overall,we felt relaxed overall after the trip.